A tutorial for using a Raspberry Pi to monitor temperature and humidity, and analyzing the sensor data using Python. 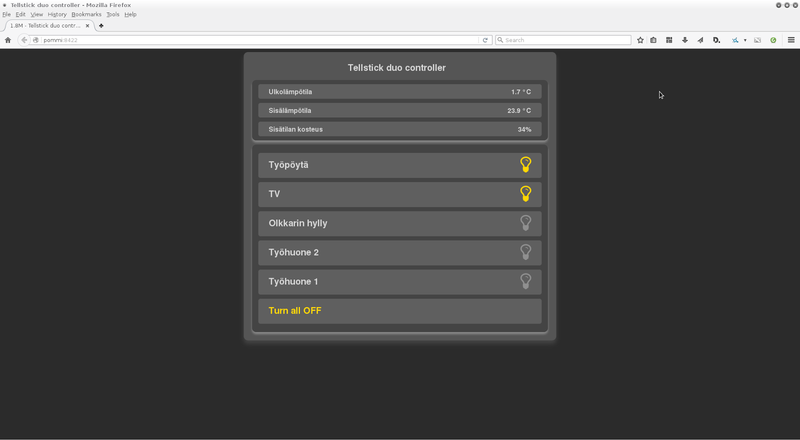 Previously I set up a simple home automation system for controlling outlets at home. So far I've used the system for controlling various lights at our home. I've been satisfied with oulet controlling via browser, but I wanted something more. I had a idea of using a Raspberry Pi to monitor temperature and humidity. I was already browsing for electronic components needed for building a system with sensors, but buying single components seemed a bit expensive, and I would also have to actually connect all the components to RPi and write the code to read the sensor data. Mainly because of the price of the components, I started looking for a pre-built system with the preferred sensors. Almost immediately I came across Proove's sensor that has indoor and outdoor temperature sensors and a indoor humidity sensor. The best part of the pre-built system is that it's already compatible with the TellStick system that I used for controlling outlets. I decided to buy the pre-built sensor system. I just needed to figure out how to read the sensor values and display them on the same UI that I built for controlling outlets. The sensor system is nice in the way that it automatically sends it's sensor data in some sort of broadcast and the TellStick Duo automatically receives all the data. Something's also flaky with the sensor system because it sends sensor data from a bunch of sensors. Most of the sensor data is just invalid data and it's up to the user to determine which sensors are sending valid data. Decyphering which sensors were sending valid data was a manual process of viewing the sensor data and comparing that to the values displayed on the sensor system's lcd screen. I managed to figure out that my system sends outdoor temperature with sensor id 135 and indoor temperature and humidity with sensor id 136. The telldus-core library that's used to control the outlets also provides functionality to read sensor data. It was just a matter of figuring out how to read the data and I found a good example from GitHub. I just added a new endpoint /sensors that returns sensor data for the two sensors and added some UI functionality to read and view the data. Because the sensor system sends invalid data with bogus ID's, I extracted the sensor ID's to their own module sensorconf.py that defines the ID's for indoor and outdoor sensors. The UI has names for the different sensor values but I didn't separate them from the logic but instead hard coded them. Published at DZone with permission of Jori Lytter , DZone MVB. See the original article here.